I learned a lot over the Summer so I decided to create a Summer Recap series to share the different concepts. Today’s concept is about the effects of blindly setting an intention in your life versus consciously focusing your intention to create your life. I’m sure you’re wondering exactly how anyone can blindly intend to do anything. The truth is, blind intention is more common. The fact that we are powerfully creative beings means that we set forth intentions all the time, whether we consciously do it or not. When you go about your day without first taking the time to intend on the type of day you want to have, you leave yourself open for anything. But when you take the time to set forth an intention for what you want to experience – in your day, for a project, a trip, anything – you are setting your desires into motion. I have a perfect example. Early this Summer I stayed away from home twice, almost back to back. The first time, I did not deliberately set an intention. I remember being excited and thinking it could be an adventure, but that was about it. I didn’t put forth my power in my thoughts. I left it at what it could be, so it remained nothing more than a fleeting excited thought. Well that adventure turned out to be quite a challenge. It was not the walk in the park I expected. I was uncomfortable for most of the time and longing to be back home. The reality is, it could have been an adventure, or it could have turned out like it did. In my absentmindedness, I left myself open to whatever could come my way. A few days after I got back home, I went right back out of town. This time, I had learned my lesson. Before I left for my trip, I made sure to set an intention to have a comfortable and enjoyable time. I wrote it down in my journal and I said it a couple of times in my head while I was on my way. The result? I had an awesome time!! Not only did I have the comfortable and enjoyable time I intended, my trip was literally miraculous. It was full of blissful and abundant experiences, and even adventure! The lesson here is that we are all powerful beings who are constantly creating. It’s up to us to consciously use the power we have so that we get our desired results. After witnessing the drastic results between my blind intention vs. my focused intention, I’ve been using focused intention all Summer and it has created more than one miraculous experience for me. Even if I forget to do it ahead of time and things start to go sour in the midst of what I’m doing, I will stop in that moment and set the intention for what I want. Remember, you are working WITH the Universe to create your life and experiences. Why not do your part to set yourself up for awesomeness. So if your goal is to enjoy every aspect of your life and have productive, successful and blissful experiences throughout, it is important to be more mindful of your thoughts and how you use them. Don’t leave your day, your next project, or your life at the whim of happenstance. Exercise the power within you to create a life you love. 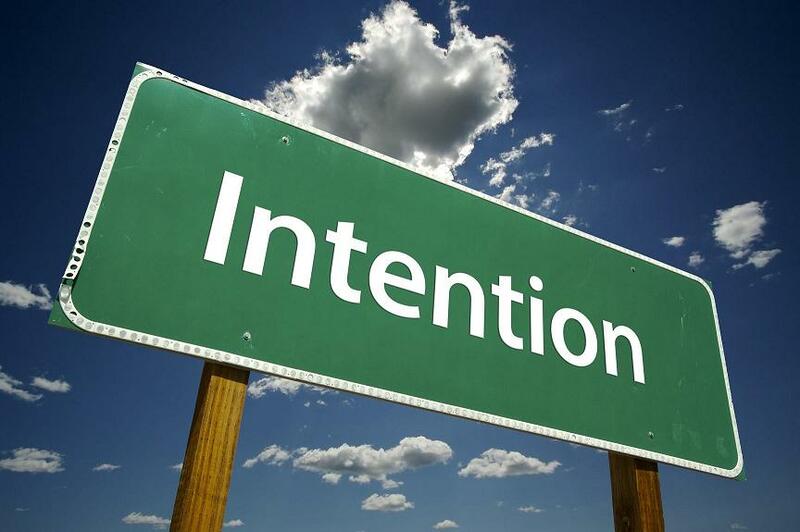 Share your thoughts in the comments: What have you noticed about the results of your own blind or focused intention?